The roots of this dish is a bit “hazy”. 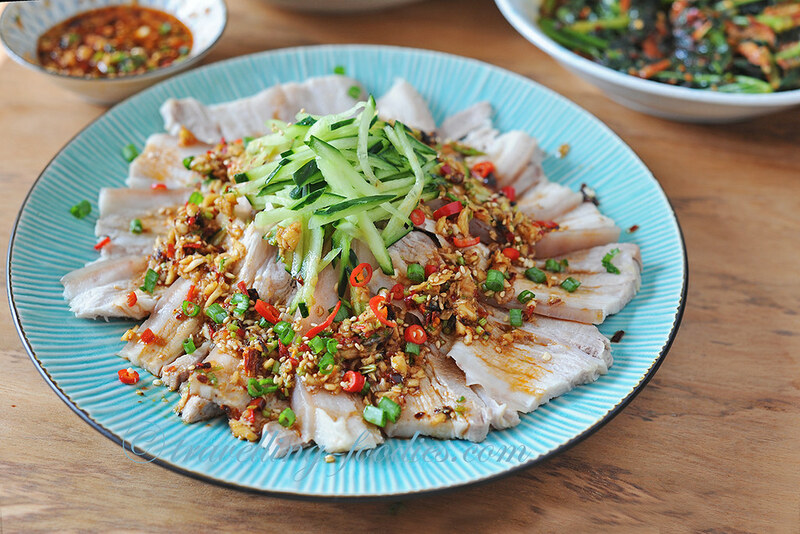 While most would regard it as one of the signature dishes in Szechuan cuisine, with the earliest records documenting this dish dating all the way back to the Song dynasty. But the earliest known culture of eating “白肉“ i.e. 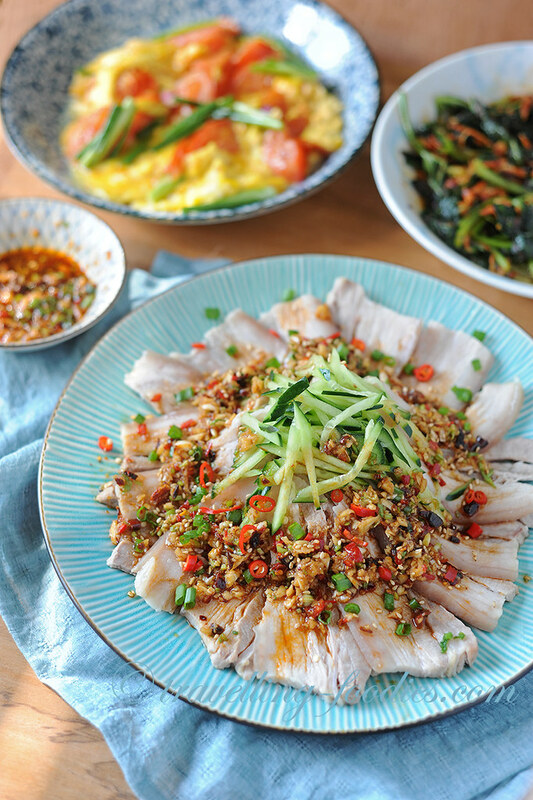 poached pork comes from the shamanism practising Manchurians in the northeastern regions of China. 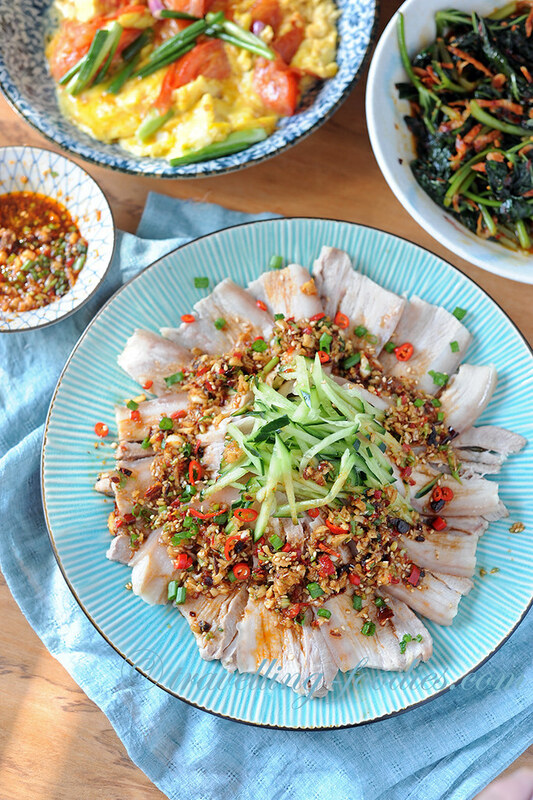 The inclusion of a spicy garlic sauce as a condiment to the thinly sliced poached pork belly is however uniquely Szechuan without doubt. The dish itself is fairly straightforward to prepare. It involves a gentle poaching of a good slab of fresh pork belly over a bare simmer and while this is taking place over the stove, one prepares the sauce which is packed with a myriad of piquant flavours. Few things to take note of in the preparation of this dish. Firstly the choice of meat. Has to be pork belly with a reasonable fat/rind to meat ratio. The fat layers slowly breaks down during the prolonged simmer and plunging the entire slab of barely cooked meat into a large vessel of icy water not only serves to truncate the cooking process by rapidly bringing down the heat, but also cause the meat to contract slightly making the textures of the fat and skin more gelatinous and less cloying. As the term “白肉“ implies, no seasoning is added directly unto the pork belly during the cooking process. Only some slices of ginger and a splosh of cooking wine are added to help eradicate any “porkiness”. That said, the slab of meat should ideally be fresh and not frozen. Bring a small pot of water at room temperature add the pork belly slab. Bring to a boil before turning the heat down to the lowest possible leaving the water as a bare simmer. Add slices of ginger and Chinese cooking wine. Let the meat sit in the poaching liquids with low flame until the meat is just cooked. Depending on the thickness of the pork belly slab chosen, it can take anything between 40 min to 1 hour. Skim and discard any scum which collects on the surface. Test by sticking a wooden chopstick into the thickest part of the slab. The meat is done if it stops oozing bloody water as the chopstick is pressed into it. DO NOT OVERCOOK. Place the cooked meat in a large bowl of icy water until the meat is sufficiently cooled. 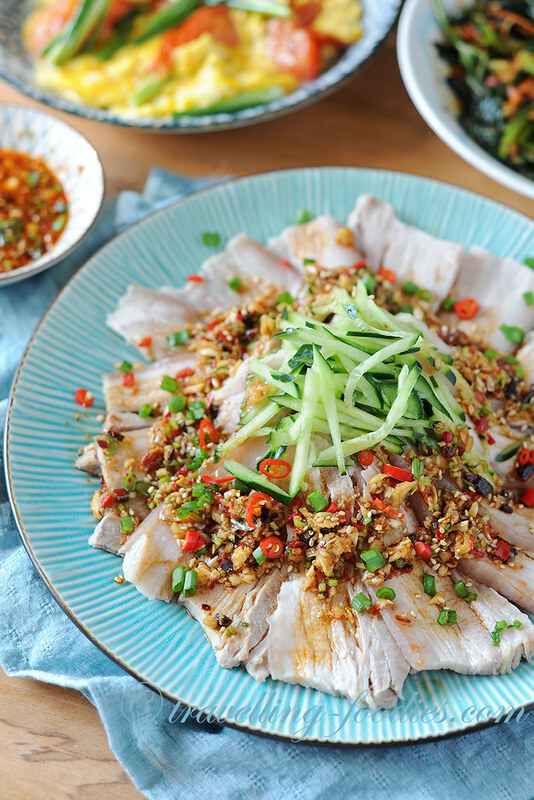 Cut the poached pork belly into thin slices. Mix all the drizzling sauce ingredients in a bowl. To assemble, first place some julienned cucumber in the middle of the serving plate. Plate the poached pork belly slices as you wish and drizzle the sauce generously over the meat slices. It can also be served as a dipping sauce on the side. Garnish with more toasted sesame seeds, chopped spring onion, chopped chili padi and chopped coriander leaves as desired. This entry was posted on March 19, 2019 by Alan (travellingfoodies). It was filed under Food, Simple Eats and was tagged with 蒜泥白肉, pork belly with spicy garlic sauce, szechuan cuisine.